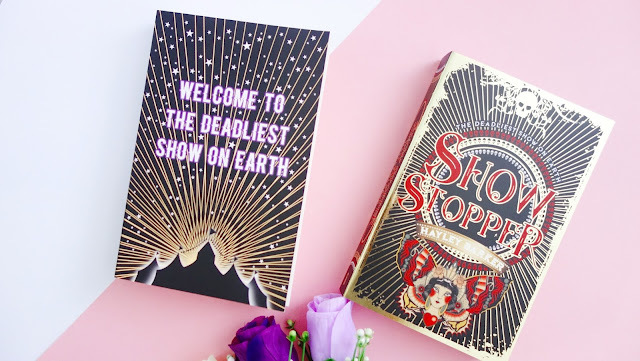 This week's book review is for Show Stopper by Hayley Barker, a book I have been meaning to start since January and one that shocked me to the core. Show Stopper was a book that I heard about way back in January! I was really intrigued to where the story would go and what the relevance of the circus was. This is set in a near-future England where the poorest people must watch their children be taken by a travelling circus and not just any circus, a deadly one. These people are known as the Dregs- literally the dregs of society, whereas the ruling class are know as the Pures, pure and white and good. Ben is a Pure and has been brought up to believe that the dregs are inhuman and a drain on society, that is until the Circus comes to town. Ben instantly falls for Hoshiko, one of the performers in the circus. Ben quickly realises that the circus has more menace than he was led to believe and as his and Hoshiko's world's collide, can they come together to end this draconian society. I found Show Stopper a huge and pretty horrifying eye opener. It was an incredibly tough read and I now desperately need something to boost my mood. The scary thing about this book is that you can picture it happening, maybe not with a deadly circus, but something similar. With the huge divide in todays world between natives and immigrants and also ethic minorities and the racial hatred that exists between people, Hayley has heightened this in a world where they have literally become the dregs of society and are of no value to anyone else. It is not a world that I would ever want to be a part of on either side of the coin.